There is rumble in the Nigerian Armed Forces, following the retirement from service of over 130, officers of the Nigerian Army. The affected officers mostly Major-Generals, Brigadier-Generals, Colonels, Lieutenant-Colonel, Majors and Captains were sent packing last week having completed their mandatory number of years in service. This is coming before the Nigerian Navy and Nigerian Air Force set to also issue letters of retirement to officers in their ranks days from now. The reason major reason for the exercise it was gathered was to pave way for the promotion and appointment of officers most of whom were due for promotion. Their retirement according to top officers would create room for the younger ones who have remained stagnated for no fault of their own. It was gathered that non-promotion of officers who were due for their next ranks was causing huge stagnation in the Armed Forces and generating bad blood amongst the personnel. The situation, it was also gathered, was so bad that in the last promotion exercise conducted last year, most corps in the Nigerian army had none of their officers promoted. The officers who had allegedly refused to quit from service had on several occasions dragged the army authorities to the National Assembly where the authorities had to explain to the lawmakers the reason they should go to no avail. Our correspondent also gathered that the Chief Of Army Staff(COAS), Lieutenant-General Tukur Buratai, who started the exercise last week, had hinted his officers during his meeting with General Officers Commanding and field commanders last Monday at the Army Headquarters Command Mess in Abuja about the retirement when he said several officers would be affected. The officers did not take his comments seriously until they were issued with their letters of notification of retirement. It was further gathered that most of the affected officers ought to have retired from service since 2016, but had refused to do so because of their strong links with the Presidency which they continued to use to intimidate the army authorities to remain in service. However, those who did not have such contacts had since retired from service and were believed to be doing well in retirement. Top army officers who spoke to our correspondent but did not want their names to be mentioned because they were authorised to do so, said that a good number of the officers who were retired last week had spent over 37 years in service instead of the mandatory 35, years as stipulated in the Civil Service Rule and the Harmonised Armed Forces Terms and Conditions of Service (HTACOS). The sources said that while those who had reached the mandatory age voluntarily retired from service some others who have Aso Rock connection, had applied for extension which was granted them by the army authorities. Under Military Law, an officer is permitted to apply for extension of service usually for a period between six months and one year. However, the retirement saga, which has been on for over two years now, is perceived to be targeted at particular set of officers, an allegation the army had denied vehemently. Sources said that officers who joined the army as other ranks before they were commissioned officers as well as officers who attended the Nigerian Military School(NMS), were mostly the target of the authorities who feel very uncomfortable with them. There are two categories of Direct Regular Combatant (DRC) officers in the armed forces. These are officers with soldier’s records and those who joined the army as civilians without any previous military service. A decision to retire 51 officers of such categories sometime in 2017, led to an uproar that made the army authorities cancel the decision. Mostly of the officers affected were personnel of the Nigerian Army Medical Corps, Finance, Education, Public Relations, and Engineers among other corps in the Nigerian army. Aside canceling the decision, the then Military Secretary was redeployed and a new one appointed. 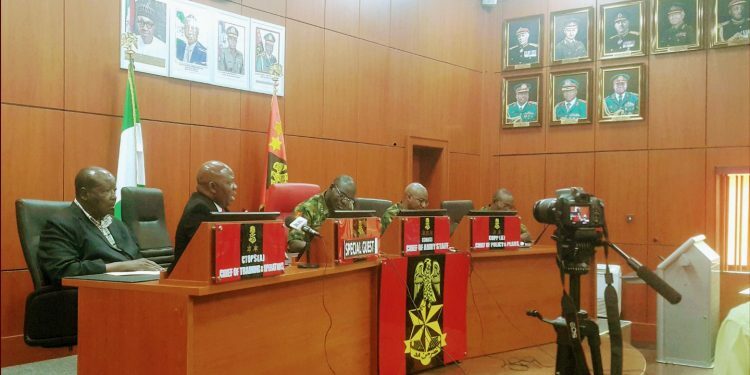 The matter did not end there as the Chief of Army Staff, Tukur Buratai, set up a committee to ascertain the circumstances that led to the issuance of letters of notification of retirement to commissioned officers with soldiers records. The committee was said to have made several recommendations and calls for the need for the army headquarters to adequately educate officers on various provisions of the HTACOS, and lease with the Defence Headquarters to amend the grey areas of the HTACOS, which are inconsistent with the provision of the Public Service Rule (PSR). It also exonerated the office of the military secretary of wrong doings saying it carried out the exercise having relied on the extant rules in the management of all officers of the Nigerian Army which include HTACOS officers and soldiers (2012) revised, manning regulations, promotion regulation, NA administrative policies and procedures as well as Public Service Rules (PSC), among others. The committee also decided that given the peculiarity of their profession, medical personnel especially consultants, Chaplain/Imam, of Brigadier General rank or equivalent and above could remain in service up to age of 60, years. Worried by the backlog of officers that were due for retirement, the army chief was said to have approached the Presidency intimating it of its inability to promote officers who were due for promotion because of the huge number of officers who were supposed to be retired from service but would not want to go. Buratai, it was gathered, had lamented that the officers’ refusal to go was creating bad blood among the personnel and affecting the counterinsurgency operations. To crown it all, the army chief was said to have relied on the HTACOS to convince the Presidency who allowed him to go ahead with the exercise. Aside the officers who were issued with their letters of notification of retirement from service, our correspondent gathered that some officers who were due for retirement but used the Presidency as a shield to remain in service were beginning to send in their retirement letters to avoid being embarrassed.